A mysterious, grinning cat who talks in riddles and can appear and disappear at will. He loves to mislead and confuse. He entered with a big smile in "Alice in Wonderland" (1951). A mysterious, grinning cat who always talks in riddles. He appears when you least expect it, and disappears whenever he pleases. A strange feline from Wonderland whose unnerving grin and absurd interjections leave even the best conversationalist struggling to keep up. As if that weren't maddening enough, the Cheshire Cat tends to vanish into thin air almost as suddenly as he pops out of it. A girl who wandered into Wonderland and a grinning cat who utters cryptic words. "The Cheshire Cat has all the answers—but doesn't always tell. The answer, the culprit, the cat all lie in darkness." 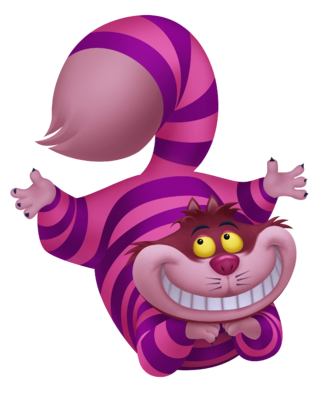 The Cheshire Cat is a pink cat with dark purple stripes from Wonderland introduced in Kingdom Hearts. The Cheshire Cat has mysterious powers and constantly teleports from one place to another. He speaks in riddles and wears an almost permanent grin on his face. He also likes to move his body parts around in odd positions, mostly his head, to see the reaction of his audience. The Cheshire Cat aids Sora and his friends during their time in Wonderland, guiding them not only in finding evidence of Alice's innocence, but also in finding the Trickmaster. His true intentions though, are not very clear, and he seems more interested in seeing how Sora would handle the challenges than seeing him succeed. After Sora and company defeat the Trickmaster, the Cheshire Cat tells the party that Alice is no longer in Wonderland, and has been taken by the shadows. He then leaves, disappearing into the darkness. The Cheshire Cat appears as a figment of Sora's memories in Wonderland, created by Naminé, giving him advice on how to save himself from being executed by the Queen of Hearts in his characteristic riddles. The Cheshire Cat assists Roxas and Luxord during their missions in Wonderland through riddles. He appears frequently, and on Roxas's last encounter with him, he asks the Cheshire Cat if he is a friend or a foe, to which the cat replies, "Neither... or both. It's quite up to you. Once you believe, truth and lie are quite the same thing. Let your heart decide — it's in your heart you must confide." In this quote, the Cheshire Cat alludes to Roxas's internal conflict in doing work as part of the Organization, and his questions about Organization XIII. Once Data-Sora is in digitized version of Wonderland, the Data-Cheshire Cat reappears to converse with him and Data-Alice. The Data-Cheshire Cat gives hints about what Data-Sora should do next. He explains how words linked to Data-Alice's memory are scattered across Wonderland, and how collecting them will help restore it. After Data-Sora completes Data-Alice's requests, the Data-Cheshire Cat will appear once again, telling Data-Sora that "Funny thing about memories is that something will lie forgotten in your heart for ages—then one day, you'll remember. But then, a moment later, the memory may drift away again to wherever memories sleep," foreshadowing what appears to be Naminé's connection with the real Sora, or Sora's memories of Ventus, Terra, and Aqua. The Data-Cheshire Cat appears again in Castle Oblivion as a figment of Data-Sora's imagination, asking him to solve a riddle. The Cheshire Cat tells the reader that he was offered a place among Maleficent's band of villains, but turned them down. The Cheshire Cat is a bizarre, rather rotund cat with a perpetual grin. The cat's fur is striped purple and pink, a pattern that stops abruptly at his wrists and ankles. His mouth, hands, feet and the tip of his tail are all a very light pink color, while the fur on his head is ruffled at the top (obscuring his small ears), and a solid red-violet. His eyebrows, which are always raised, are black, and his eyes are yellow. His nose is a dark rose color, and below it, are six grey whiskers, three on either side of the cat's upper lip, that are oddly off-center from the follicles. His hands and feet both seem to have opposable thumbs, along with three other fingers or toes. Each of his digits sport short, black claws. The Cheshire Cat displays a high degree of balance and dexterity, usually standing on his hind legs and occasionally on his hands. Most notably, the Cheshire Cat is able to make parts of his body appear and disappear at will, remove his head from his shoulders and continue talking, occasionally balancing it on his feet during his handstands, or even balancing the rest of his body on the head itself. A demonstration of the Cheshire Cat's strange and questionable behavior. The Cheshire Cat is a strange character, talking in riddles and often confusing people who speak to him. Even Roxas remarks this by saying, "That cat is a walking question mark." He often helps the characters, albeit indirectly, showing his neutral alignment. The fact that he talks in riddles and knows almost everything and anything in Wonderland proves that he is quite smart. In Kingdom Hearts 358/2 Days, he admitted that he is "mad". The Cheshire Cat's perplexing personality that deems him as neither an ally nor enemy confuses many characters, including Maleficent and other related villains who, in the Kingdom Hearts manga, offered the Cheshire Cat a spot in their alliance. However, the Cheshire Cat refused, leaving the group upset and wonder whether he should be eliminated or not. Keyhole (chapter) However, this shows that the Cheshire Cat leans more towards being a friend than a foe to Sora and his friends. The Cheshire Cat first appeared in Disney's Alice in Wonderland which was based on the book by Lewis Carrol called Alice's Adventures in Wonderland. In the film, the Cheshire Cat first appears to Alice in the Tulgey Woods during her pursuit for the White Rabbit. When Alice questions him for an answer, the Cheshire Cat responds to her only in silly questions and demonstrating his abilities to her. Eventually, he advises her to seek out the Mad Hatter and March Hare for answers; however, Alice was reluctant to associate with people who she thought was mad. The Cheshire Cat tells her that everyone in Wonderland is mad, including himself, before he fades away into thin air while laughing and singing in the process. The Cheshire Cat encounters Alice once more when she had a breakdown after her failed attempt to look for the White Rabbit. No longer desiring to find the White Rabbit, Alice asks him how to return to her home world. He replies by telling her that it is impossible for her to leave, as everything in Wonderland is done by the Queen of Hearts. He guides through a secret passageway that leads the Queen's kingdom. During the croquet game between the Queen and Alice, the Cheshire Cat plays a trick on the Queen of Hearts, resulting the latter to blame Alice and sending her into a trial. Before the Queen sentences Alice to be beheaded, Alice insults the Queen and the Cheshire Cat appears to echo the former's insult, further angering the Queen and causing a climatic chase to ensue. This page was last edited on 24 March 2019, at 11:16.